In Michigan's U.P., Visitors Welcome, Just Don't Stay Folks from Michigan's Upper Peninsula — or "Yoopers," as they call themselves — want you to know how lucky they are to live in such a beautiful place, how hard it is to do that, how their jokes about themselves are funnier than anything you've heard — and why you shouldn't move there. Folks from Michigan's Upper Peninsula, or "U.P." 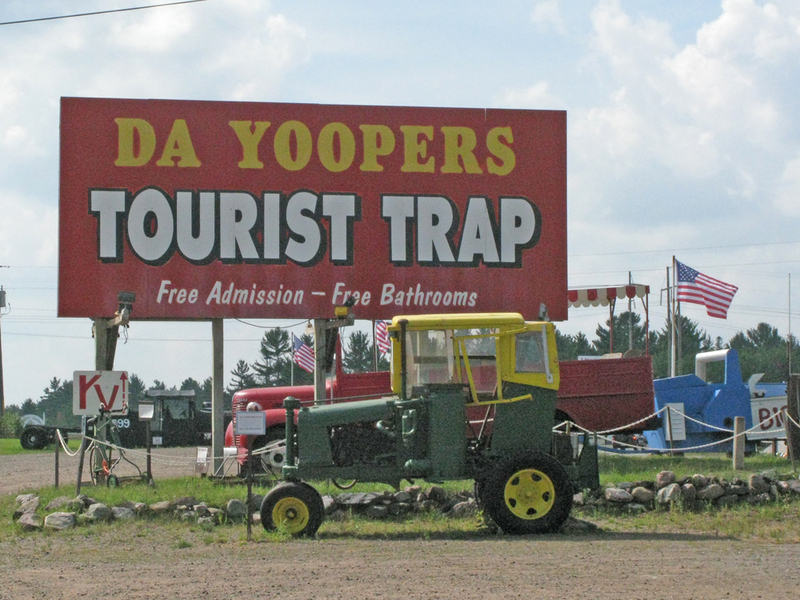 for short, refer to themselves as "Yoopers." Marquette, Mich., is a place you have to experience twice. This trip, I packed fleece and tried to bring a jar of thimbleberry jelly back home. Instead, I needed sunblock, and my jelly was confiscated at the airport because it was more than three ounces. Mistake. Daytime temperatures in downtown Marquette were near record high — low 80s. No wind, calm lake, Yoopers marking territory on the shore of Lake Superior. The summer had been colder than normal. So in the last throes of Daylight Saving Time, it was beach week in Marquette. Got a sunburn. The last time I visited, it was winter and wicked cold. Brisk gusts of wind slapped my face on the way down to the shore. The cafe patios were closed. The massive iron ore rail troughs stood silent guard over the harbor. Cross-country skis replaced bicycles on the paths hugging the shoreline. Longtime residents advised me: If you want to live in the Upper Peninsula of Michigan, get an outside hobby. And if there is one thing that puts Marquette on the map, it is speed skating. This time, my visit coincided with the Olympic trials for short track — and the stars were out at the Berry Events Center. Apolo Anton Ohno made the team but placed second. Before the action on the ice, the community wanted to welcome all the visitors. The theater department of North Michigan University was commissioned to put on a show. On a balcony overlooking the oval, earnest performers in shades of red, black and white presented a pageant of the immigrant experience on the shores of Lake Superior. The people we met were no-nonsense, hard-working, humorous and welcoming, but wary — similar to residents of other historically isolated places. New technologies have opened a new vein of ore. Communication is no longer a journey by boat, rail, car or plane — now it's just a click away. Yoopers want you to know how lucky they are to live in such a beautiful place, how hard it is to do that, how their jokes about themselves are funnier than anything you've heard — and why you shouldn't move there. Just visit. Anytime. Come again. And next time ship the thimbleberry jelly home.